There is a big problem with using non-specific language about recognizing threats, using force, and surviving violence. The problem is that under stress - adrenaline...fear...pain...is the worst time to be figuring things out and making decisions. Our goal in Krav Maga training- the kind we teach and practice, is to Control, Incapacitate, or Terminate a threat, using our bodies or any other tools in-hand. There is no reason to use vague terms in teaching or learning, because everyone has a common framework for understanding what a neutralized threat looks like by watching contact sports. We learn a great deal about what works for self-defense through sports medicine - bodies hitting each other at-speed, and bodies hitting the ground. Every weekend in North America, we see examples of what a neutralized threat looks like - a player down, on the football field. 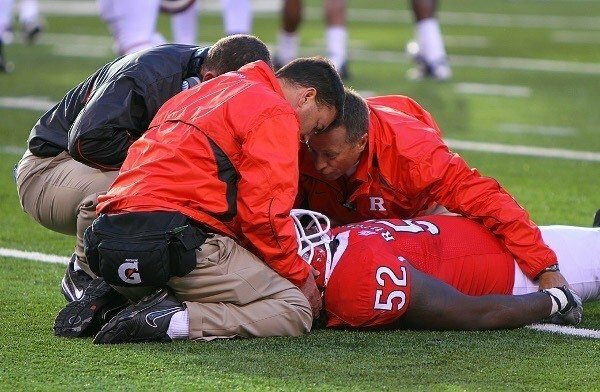 Trainers kneeling next to him, and several minutes of assessment to see whether the player can safely get up, or needs to be carted off. 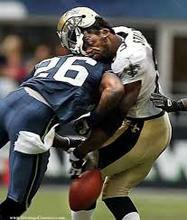 The player is more focused on his pain and covering his injury than in getting up or playing more football. 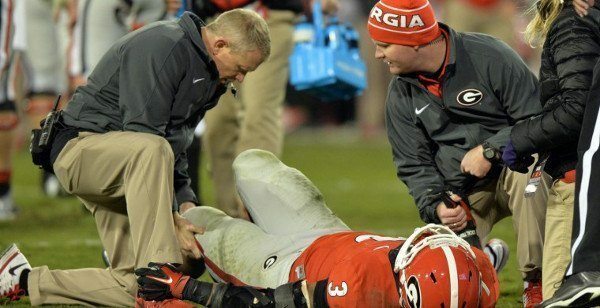 He’ll be carted off the field. No more football today, no football next week. Maybe more football later in the season. Note - these images are included respectfully, for learning purposes. 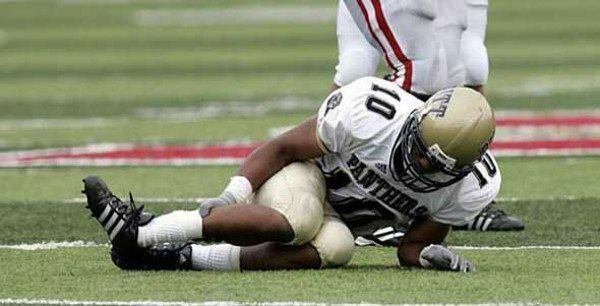 Some of these athletes unfortunately never fully recovered. This is what a neutralized threat looks like. A potential attacker is neutral or defensive, prone on the ground. He is covering injuries or places that hurt, and is not interested in anything else. He won’t be attacking again today, or for a while. If the threat is serious enough, he won’t ever be attacking again, but this should be a rare thing. This is counter to the “stun and run” approach. Stun and Run means one or two sudden techniques are used against an attacker, such as a groin kick and palm heel strike, before making an escape. This approach can work, but doesn’t always work. Some people are tougher than others, and some can take pain. We should have clear, easy to understand guidelines to follow in training and not think we are going to be assessing a situation on the fly. ​There are some injuries that exceed the human threshold to continue from - regardless of pain threshold, toughness, or drug use. Maiming a threat is not the goal of training, but we should all understand where this limit is in ourselves and others. 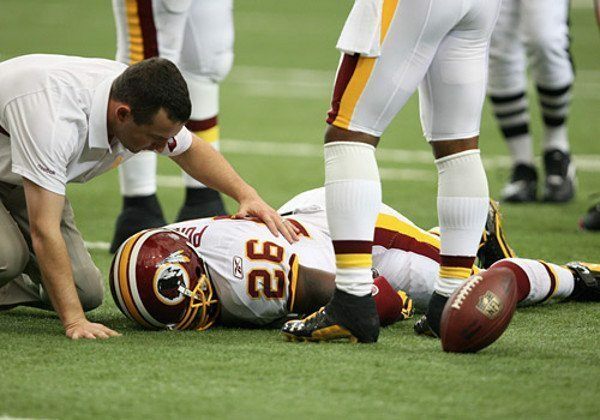 Whether you are interested in football or MMA or not, you should watch some video clips of what happens before the moment of injury, and what the injured athlete looks like while he is down. It can be hard to watch, but this is what an identified threat should look like when you have survived the encounter. See the posture - down, on the back, side, or stomach, not trying to get up, often curled or holding a limb, with the only real movement rocking back and forth involuntarily, trying to find less pain. These aren’t images that normal people should spend time on for entertainment, but if you are serious about self-protection, you need to know exactly what to do, when to get started, and what the successful outcome looks like. Krav Maga Training Tip: Make sure you are training to incapacitate an attacker, and see these postures over and over again, before scanning the environment and escaping. Good control, a good training partner, and slowing training down a bit are required. The elements of speed and intensity can easily be added later.